Viewing the trip and its opportunities through the lens of education, I too found myself face to face with the unexpected. Much of this surprise was perhaps due to my own naivete, but many times it was because I allowed what I saw and heard about the Chinese prior to going on the trip impact my perceptions much more than I had anticipated. My primary focus was to try and understand in what ways the traditional educational environments (K-12 and higher education) played a role in the environmental education of the populous in order to confront the multitude of environmental issues facing China. Indeed, K-12 and higher education was too narrow of a focus. Throughout the entire journey, people not associated with schooling talked about the issues the commoners faced in China regarding simply not knowing what good environmental choices were. It was obvious that many who had exposure to some sort of environmental education were willing to make different choices, but these choices were also mediated by each person’s economic position – i.e. will saving this resource keep me employed? As far as traditional schooling supporting environmental education, the Chengdu Panda Based provided excellent insight into the current thinking on this relationship. The presentation we witnessed at the base was the premiere for a fourth grade curriculum that dealt with specific issues of conservation. The pulse from the educators around the room was supportive of the new curriculum, but they also voiced great concern about being able to “fit it in” with the rest of the required curriculum. When asked about the possibility of aligning the conservation curriculum with the traditional curriculum as a way to be interdisciplinary, as well as a way to limit the need to add extras, the suggestion was met with blank stares and smirks. The concept of aligning ideas with the traditional curriculum would provide teachers with a “personal interpretation” of the curriculum – something that was not allowed. This divide presents quite a problem. During our discussions with the EPA were were assured that the schools were indeed discussing environmental matters, but there were not formal programs in place. And even when formal programs had been designed, like at the base, these were only supplementary and done if time or money permitted. These disconnects have long been a problem in the US, and with the increased importance on standardized testing, they loom even greater today. America and China both have the need to find ways to integrate environmental curriculum, as opposed to always making them a supplement to learning. America has a benefit because we can utilize the local control that is part of our educational system, and, even though many teachers may disagree, there is an opportunity to personally interpret how content should be experienced by students to what extent it should be conducted on an interdisciplinary level. In the future, I am increasingly interested to watch how the Chinese seek pathways to mesh the traditional and the environmental/conservation oriented curriculum’s. It is obvious in our talks that there are many Chinese who are passionately dedicated to the future of environmental education in China and who are trying to find the bidge between tradition and the environment. How to sum up this incredible experience? On the one hand, I know that we have barely scratched the surface in trying to understand the social context of environmental attitudes and practices in China. On the other hand, we did see and learn a ton in just two weeks so what follows is a first, tentative (and a bit lengthy—sorry!) attempt to organize some thoughts. I had read about China’s double-digit growth over the past decade, but it was fascinating to actually see and feel it. To me, it felt like Japan in the 1970s and 80s in the heyday of the bubble economy. Everywhere we turned we saw signs of China’s embrace of “modernity”—from billboards to construction cranes to mobile phones. One of our colleagues at Sichuan University put it this way: no matter what their current standard of living, everyone is working hard to get to the next level. One night in Beijing we made a brief foray into a “hypermarket”—this one was named WuMart, which probably explains why we were drawn to it. A smaller version of the bigger hypermarkets, WalMart and Carrefour, this place was nonetheless packed with shoppers buying everything under the sun. It would be interesting to explore further the cultural twists on consumerism in China, but there is no question that it is here to stay and that it is going full-tilt . As Thomas Friedman points out, the prospect of 1.3 billion people aspiring to middle-class lifestyles is a scary prospect for the global environment. I remember that at our last meeting of the Hales reading group prior to departure, we half-jokingly described the Iceland/Denmark and China trips as looking at “best practices” and “worst practices,” respectively. So, is China headed for an environmental train wreck? We’ve certainly seen firsthand some sobering results of the fervor for economic growth. We haven’t been to a single spot where the tap water is safe to drink (though we were told locals in some places drink it without boiling). Driving to the Great Wall we passed numerous dried up river beds north of Beijing, evidence of the acute water shortage that city is facing. Air quality is still a major issue in the big cities (of which there are many), though the Shanghai Daily reported today that April had 23 “blue sky” days, the most since the year 2000. The many dams on China’s rivers have had an adverse effect on biodiversity—in fact, we were told that ten of China’s top scientists had recently written an editorial in one of the leading newspapers stating the scientific argument against more dams. And, ironically, traveling to Shangri-la, we encountered garbage dumped along the roadside at regular intervals. In spite of all this, I have to say I came away from the trip cautiously optimistic about China’s prospects for balancing economic growth and conservation. In some areas, China is clearly ahead of us in environmental standards. For one thing, from what we could tell, many of China’s leaders do recognize the seriousness of environmental problems. Green signage is everywhere, for example, exhorting people to be eco-conscious and “civilized” citizens (it’s not clear how these are interpreted, however). Every day we were in China seemed to bring news of some new initiative—a $60 million loan from the World Bank for clean coal technology, government subsidies for alternative energy, including a plan to cover one-fifth of rooftops with solar panels, the postponement of several dam projects due to environmental impact reports. The government’s ability to engage in intentional planning and nationwide implementation of environmental standards was evident in, for example, the requirement that cars older than ten years must be taken off the road, the use of solar panels (and occasionally small wind turbines) on street lights, and the banning of scooters with two-cycle engines. Electric bicycles were also prevalent—owners simply remove the battery and recharge it in their apartments (a fully recharged battery gets you about 80 km). The difficulty seems to come in the implementation of top-down policies, however well-intentioned. One Chinese proverb apparently states that “for every top-down policy, there is a counter-measure from below to evade it”. In our limited experience, it did seem that rural areas were clamoring for jobs and development projects, especially tourism that could provide jobs for ethnic minorities. In the process it is easy to see how environmental concerns can get swept aside. On the other hand, though we certainly saw rural areas that could be considered “poor,” I was struck by the relative absence of slums and “abject poverty” that are a grim staple of urban life in many cities in India and Africa. To my mind, this is a considerable achievement, and it makes me wonder how we should weigh the environment consequences of growth against the fact that China’s economic boom has been responsible for pulling millions of people out of poverty. This is pure speculation, but if the names of the structures we saw in the Forbidden City—Hall of Complete Harmony, Palace of Earthly Peace—or the philosophy underlying the many traditional Chinese medicinal clinics—health depends on balancing opposing forces such as hot and cold, excess and restraint—is any indication, there may be a deeper cultural and religious compass that can help guide restoration of the balance between the seemingly opposing goals of economic development and conservation (full disclosure: I did receive a 70-minute foot massage at one of these clinics☺. Finally, we got some interesting glimpses of Chinese attitudes towards American stewardship of the environment. I remember asking Ted Burger’s friend, Lin Lang, who took us to see his 93-year old grandmother, whether there was hot water in the hutong (traditional Beijing neighborhoods). He just laughed and said, “No, of course not. We always joke about how the Americans can’t do without their hot showers.” The same sentiment came up in our conversation with party officials at the national environmental protection agency, who confessed that their image of Americans was of wasteful use of electricity and water. Similarly, an editorial in the China Daily News promoting green practices reminded readers that most of global warming to date has been caused by the harmful policies and practices of the U.S. and other “developed” countries. In this respect, the trip has definitely confirmed for me that there is no moral high ground Americans can occupy in the debate over global environmental change. We did discover that hotels in China take no chances with guests of any nationality —your room key activates all the power in the room so power is automatically cut off when you leave. Well, I’m out of time, but just want to conclude by saying that this trip has exceeded my expectations in every respect. I am extremely grateful to the Hales Fund, to my colleagues in the reading group, to Rujie Wang (for his assistance at every turn! ), and to my wonderful travel companions, Susan and Matthew. I have a feeling that this is a trip that will “keep on giving” for many months and years to come. My impressions about the state of environmental awareness in China suggest a picture that’s not quite what I expected. People do value the environment and seek out opportunities to spend time in nature — this was reflected in stories in the airline in-flight magazine, celebrating China’s natural scenery, and in the nature tourism that we saw. But nature as unmediated by humans, the wilderness that we celebrate in the West, may be a more foreign concept and even (according to some of our Chinese colleagues) a frightening one. Here is a photo of a plastic tree that was in the Kunming flower market; we also saw nature enhanced by neon, and in other ways a product of human constructions. What we did observe was a very high level of official concern about practices that could harm the environment — more so, I would say, than in the U.S. This list of green practices from the Chengdu hotel is very extensive! Every (English-language) newspaper that we saw had articles and editorials relating to environmental concerns. The people we spoke with confirmed that it was a default priority. They are all aware that China has a large population and environmental resources that are threatened or limited. It’s not about an altruistic (or ecocentric) love of nature but about survival as a country. This national priority does not necessarily translate to the level of individual awareness or empowerment, which may be one reason that official policies may be subverted at the local level. And opportunities for individuals, particularly children, to connect with nature in the city seem limited. So can a powerful central government prescribe not just behavior but values? And is that necessary? 3. All tofu dishes – they all were amazing! Though it may seem odd that we have spent so much time talking about our culinary travels, in fact it is no so much the food that was of importance to us, but the meal itself. Each day we were able to sit down together, and with new acquaintances in a manner very different form what we each new. We were able to gain a deeper sense of place through what we ate, how we ate, and the conversations we had during each meal. For the past 13 days, meal time has been a way for us to debrief our thoughts and use each other as way to jointly construct our understands from each day, and see how those understanding were building upon and informing the perspectives from past days. Yeah food! Tiananmen Square –This space is very difficult to portray in photograph due to its immense size. One feels very small when trying to navigate the throngs of people from one side to the next. 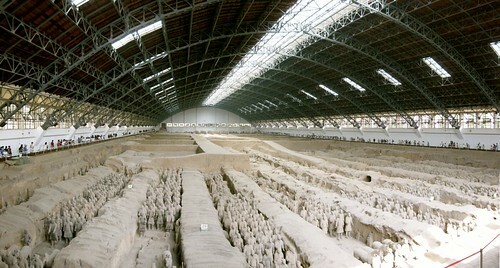 Below is the Great Hall of the People and the Monument to the People’s Heroes. The Forbidden City –Is HUGE! The Imperial Palace ( a series of 9,999 halls and rooms) was used from 1400 AD to the early 1900’s. These grounds were impressive in their expanse and devotion to tradition. Tourists from every nation could be seen, heard, and at times felt as we toured the grounds. Culinary Travels –We had to finish our journey with a meal of Peking Duck – a Beijing specialty. Our experience did not disappoint. To top things off, we had carrot nested garlic birds, and a stunning display of fruit on dry ice to top off the meal. What a wonderful way to end our trip. The most AMAZING noodles ever (David and Matthew each had two bowls). Food total for 5 bowls, 2 sides of cucumber, 1 side of cabbage, and three beers = $7.50. Up to this point, we had no repeat dishes while in China. But in this hole-in-the-wall, Matthew found his noodle nirvana, so Saturday’s dinner was an encore of Friday’s lunch. And much enjoyed. Government prioritization of the environment can be seen in the increased status of the NEPA, which went from an office to an agency to a ministry in recent years. Despite new concerns over the economy and swine flu, we were told that environmental considerations are always paramount. Is this all top-down? The bureau chief mentioned individual initiatives and solicitation of public opinion via the internet. The public sees the EPA as the government agency that is most helpful to them. The last photo in this group is of the “Egg”, Paul Andreu’s famous new National Grand Theatre. Yes, we enjoyed an opera performance there — all in the name of research. Finding a taxi afterwards was the most difficult thing we’ve done on this trip. Our translator kindly took us to see his 93-year-old grandmother, who agreed to let us take numerous pictures. We asked her what changes in Beijing she noticed most over the past 50 years and she said she could not compare the cities. – People in China do value experiences with nature, but engage in them rarely, primarily because they have very little leisure time. Work spills over into evenings and week-ends, and a day-long (or even half-day) family outing would be very unusual. – Pets are quite common, mostly cats and dogs, and this is a change from previous times. Wildlife watching and organic food are also becoming more popular. – Traditional zoos in China used to include signs about the ways in which the animals and their parts are used for food or in traditional medicines! – The Tiger Leaping Gorge dam project has recently been cancelled — hooray! — due in part to local pressure. – The national government does prioritize environmental protection. Local governments, however, are often more focused on economic development, particularly since there is still a great disparity between rural areas and the big cities, western and eastern China, in economic status and access to opportunity. We hope to continue our conversations with the faculty at Sichuan University in the future, and we thank them — I had to say it! — for one of the best meals we’ve had so far on the trip.